How to fix FTP problem in Reliance Jio sim internet. When Reliance Jio 4G LTE Network scheme is a very good scheme for Digital India. We should give thanks to Reliance and Mukesh ambani that he gave us free Internet and voice pack for 6 months. Hope he will extend it for 1 year. I am a Software developer and I am very happy with Jio 4G LTE Network internet speed. But when I connected FTP then My FTP FileZilla software stuck and not connected with FTP server. So I was not able to download a file and upload coding files when using Reliance Jio 4G LTE Network internet server. When I faced this problem I have changed my FTP setting in my system and it worked. Listed below attached image; wher you can find the solution. You need to change General setting FTP client while creating FTP connection in below section. 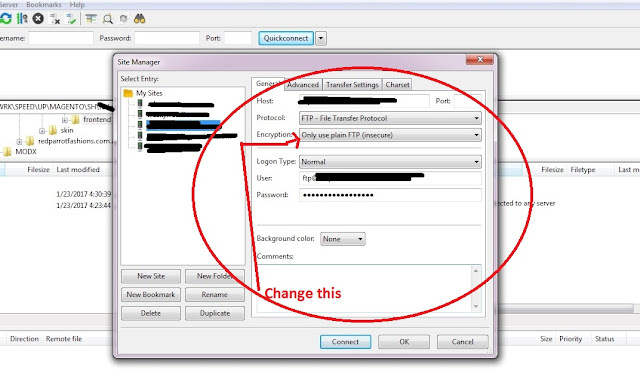 Encryption to "Only use plain FTP(insecure)"